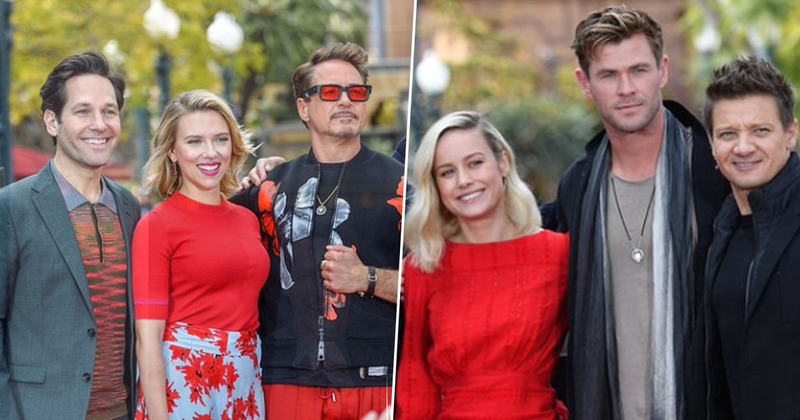 Stars from Avengers: Endgame gathered together at Disneyland for the announcement of an epic charity event named Avengers Universe Unites. We’re still not sure how our favourite superheroes will go about restoring the universe after Thanos’ snap, but while we wait to find out the actors have been passing the time by helping to do some good on our home planet. This week Disney announced Avengers Universe Unites, which supports The Walt Disney Company’s signature philanthropic commitment, Disney Team of Heroes. This Team of Heroes is not to be confused with the team of heroes who attended the event. We’ll stick to calling them the Avengers, just for ease of understanding. Disney Team of Heroes delivers comfort and inspiration to seriously ill children around the world, and yesterday Robert Downey Jr., Chris Hemsworth, Scarlett Johansson, Jeremy Renner, Paul Rudd and Brie Larson, as well as Disney CEO Robert Iger, appeared at the California resort to announce a donation to nonprofits. In celebration of the highly anticipated sequel to Infinity War, Disney, the LEGO Group, Hasbro, Funko and Amazon will donate $1 million in cash from Disney to Starlight Children’s Foundation, which will benefit children’s hospitals across the U.S. The companies will also gift more than $4 million worth of Avengers: Endgame toys and products to hundreds of children’s hospitals throughout the country, as well as Give Kids the World, a nonprofit resort in central Florida. The superheroes in Avengers personify traits like courage, perseverance, bravery and hope—the same traits countless kids and their families in children’s hospitals exhibit every day. We are grateful to have the Avengers cast take time out of their day to be a part of this effort to lift spirits and bring comfort to children during a difficult time. The actors were later joined at the event by children from the Boys & Girls Clubs of Anaheim and Garden Grove. Nobody understands magical experiences better than Disney, and we’ve been proud to partner with them in bringing those experiences to kids in children’s hospitals for more than 20 years. From delivering hospital care packages, to storytelling through Starlight Xperience virtual reality, to our recent Disney-themed Starlight Gowns, millions of seriously ill children have benefited from our amazing relationship together. And with this donation, even more kids will get to experience the magic of Disney.